Kate is Nickie’s partner in crime for #vlogchallenge. She is blogging queen over at I am Wit Wit Woo and the topic was a beauty (or fashion) Vlog! So I sulked a bit, and then realized that I go to the effort of Hennaing (is that right?) my hair on a semi regular basis, and that’s a beauty thing. Isn’t it? Yeah. I’ve been doing this for quite a few years now, and to me it’s quite an easy process, but I’ve been surprised from some of the Twitter / YouTube comments that it seems laborious to others? How easy is it to commercially dye your hair these days? Anyway, here’s my Vlog, have a look and let me know if it seems like extra effort to go to! I must admit I’m loving the Vlog Challenge, and although I’m unlikely to head down to London any time sooN, I quite enjoyed Tinuke Circusmum‘s Tips for getting around London! The next #VlogChallenge is tomorrow & set by Nickie, so keep an eye on iamtypecast.com for the next topic! 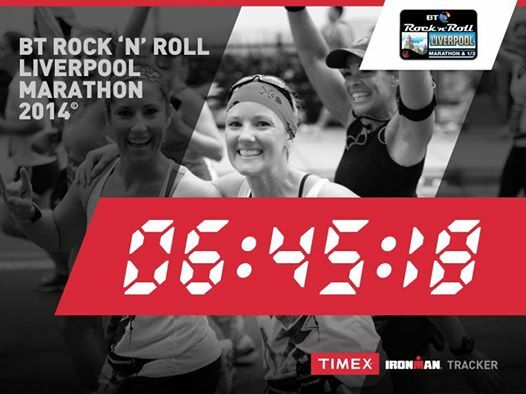 Rock n Roll Liverpool Marathon. 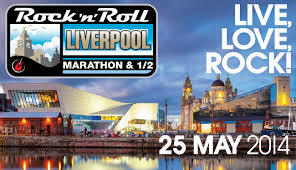 He’s right, that’s pretty much how I did the Rock n Roll Liverpool marathon this May, and it’s taken me nearly 2 months to sit down and write about it. Mostly out of laziness. Seems like my blogging & running habits are in sync. 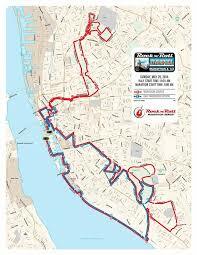 So The Liverpool Rock N Roll Marathon. Lets start by saying a BIG THANK YOU to Stephen, a (not too) old friend I haven’t seen in years for letting me crash at his house the night before the Marathon. And also the other Stephen (two Stephens in one flat, confusing for blogging about, but possibly an awesome sitcom premise) who loaned me his bed & cooked a lovely carbalicious meal the night before. THANKS GUYS. We’ll do lunch soon I promise! The marathon, well it was mostly UP. I know Liverpool is very up, I saw the course profile, and the first marathon I did was Liverpool (different organizer) but I was expecting that after the UP there would be a little down. It’s only logical. There wasn’t. Liverpool defied all know geographic laws. I have reason to suspect M.C Escher was part of the route design team. So it was a very up marathon, more up that I anticipated. So I wanted a 5:30 marathon. Not massively ambitious. Northing too fast, and I set off with the 5:30 pacer and stuck with them for a large part of the first 10k, then I sulked a little and dropped back to the 5:45 pacer…. then at about mile 16 I lost the will to run uphill any more and walked… FOR AN HOUR. The race was a little bit disappointing. It was billed to be a Rock N Roll marathon with bands and music at every mile, but there really weren’t that many bands playing for the slow coaches at the back of the pack. Even when I was still with the official pacers I only saw one band, a group of drummers just after Everton Football grounds. They were pretty spectacular,, definitely motivating to get up the hill they were on. Not so much Rock N Roll, as here’s a Mix Tape N Some Speakers for you to run past. That said, I could still be sulking at my in ability to continue running up hill & even after I started to run again, it was more of a run/walk/moan effort, but I completed the course. Owch, I know. A full hour and fifteen after I hoped to end. Miserable. The upside of this is that my walking meant I wasn’t too sore the next day, and I didn’t fall asleep on the way home either. I did eat the world. No, I think I’m over marathons now thanks. What’s the next running thing then? Well, as a leaving present, aside from some cake, the Lush Preston team got me a ticket to 2.8 Hours later a Zombie Running thing on 24th July in Manchester. So I at least should get my trainers back on once this month. I realise that I have it written over there in the little discription of my blog, yet I’ve never really mentioned things I’ve knitted. Hevs, aka Heather Smith, is an amazing illustrator who I have the pleasure being friends with & spent many Monday mornings opening up Lush Preston with. 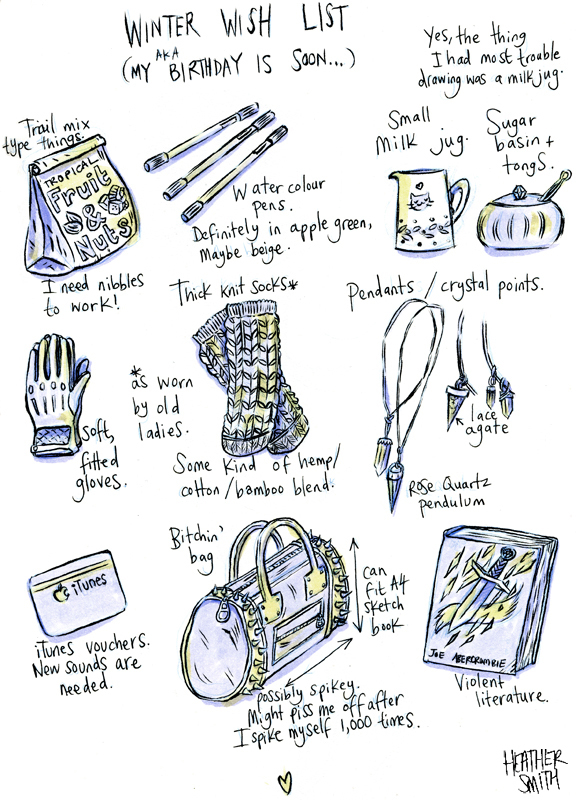 Back in December Heather posted this beautiful drawing to her Tumblr. And I thought “SOCKS! I can do that, no problem, 2 weeks is an easy deadline!” I bought a bamboo / cotton blend yarn & cast on. I finished & gave the socks to Heather at the end of June. Yeah. I possibly made some notes of how I knit them, leave me a comment if you’re curious about how they were made & I may attempt to write up an actual pattern. There, knitting, now for the coffee. No seriously, look at my face, I’ve made a Vlog. Then you can watch my fabulous vlog! and then subscribe to the RunforTheQuiet YouTube Chanel, so you never miss my face again! Is it safe to stop hiding now? Yeah, #Juneathon lasted all of 2 days. Sorry, I did mean to do it, honest. Life just got in the way, and a little laziness. Congratulations to everyone who did take part & manage to Jog / Blog / Log for anything more than 2 days! I did no sporting things in June, even my two attempts at Juneathon were really lame efforts. Up until a little while ago I worked for Lush. It was great, I love Lush & working for the company was great fun, but, like Star Trek: TNG said, “All good Things…” and all that jazz. The only reason I mention this is because I felt really weird working for Lush and then coming home & blogging about it too, I know some staff do, and that’s fine, but it was weird to me so I didn’t. But now I don’t, so I can go on & on & on & on about Lush all the time! Mwhahahaha! Anyway, lets get to the point. Last Friday I went down to Liverpool Lush, why did I shlep 44km, when there’s one in the town I live in? Well, because up above the Liverpool store is a Lush Spa. When you get to Liverpool you’d never notice anything different, it’s just a really busy, big Lush store (the biggest in the world, or it was when I left the company, it could have changed by now.) Now I’d booked my treatment over the phone earlier in the week, and bought a voucher at Preston Lush, so all I had to do was rock up at the right time and give the gent at the till the magic ticket & wait for the Lush Therapist to come say “hello” and lead you upstairs to the Spa. Lush doesn’t do things like other companies, and the same applies to their Spas. It’s almost an Un Spa, upstairs at Liverpool (and AFAIK all the Spas) is like visiting your Great Aunts house. That eccentric aunt who has a tonne of weird books, furniture older than you, and also 16 types of tea for every possible mood or occasion, and would be mortified if you asked for milk in any of them, but would happily add a little gin if it was after 11am. Flying ducks on the wall, flowers in jugs, that style of thing. The 8th incarnation of The Doctor would have loved it, if he’d gotten more screen time, and Lush did product placement. I’d booked in for a treatment called The Sound Bath. A powerful, 60-minute meditative treatment that helps you listen deep within. Primarily focused on the head, this treatment takes you on a journey into sound – and yourself. I’ll confess when I first picked this, I just wanted an hour to (almost) myself and pampering without having to take any clothes off. 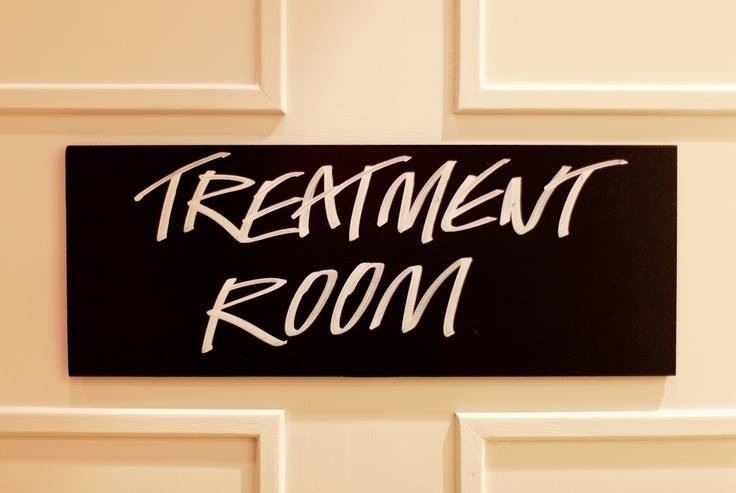 I’m not a touchy feely kinda gal, there’s another Lush Spa treatment called The Spell that’s mostly a foot treatment, but has a great head rub in the middle, I fancied 60 minutes of that. The Sound Bath is a little more than a head rub. It’s like a lot of Lush products, aiming to be something quite normal, but ending up almost as if it’s been designed by an Jim Henson Alien who’s only had John Crichton explain the concept to them. The aim of The Sound Bath is to relax you to a point where your head, and all the chitter chatter in it, is just quiet, and, if you want, you can listen to the voice within. 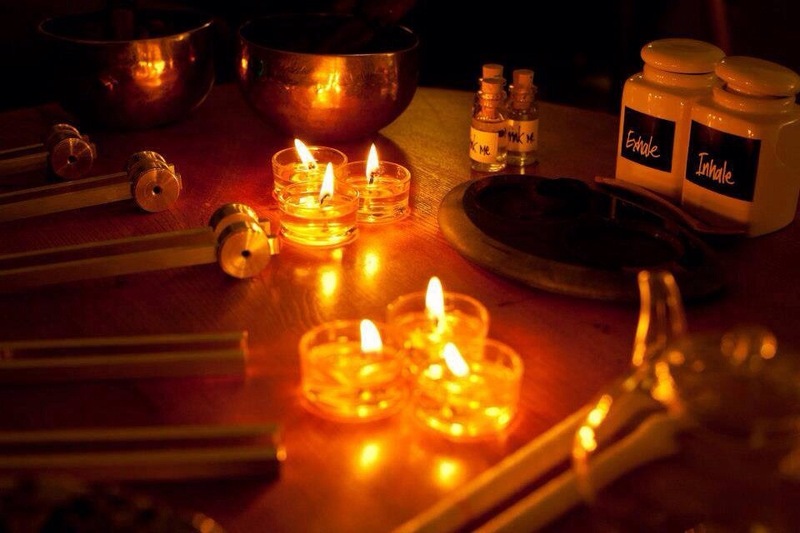 So what you get is a hot stone facial, a fabulous head rub, mixed with Tibetan singing bowls and Ohm Tuning Forks, with a couple of Ear Candles thrown in too, and cold stone facial at the end to bring you back to the real world. It doesn’t sound like it should work. The more I write it down the worse it seems. Did I mention that it has bird song mixed into the sound track? See, bonkers. But, like Fish Fingers & Custard, there’s some kind of mad genius at work here, and everything just works. After the hot stone facial has gotten you really settled and you’ve started to relax, the therapist uses the tuning forks on points of your forehead, the sound literally washes through you and you’re falling deeper down the rabbit hole, by the time the therapist asks you to turn onto one side and starts the ear candle part of the treatment you’re practically on autopilot. Eventually I had to return to the real world, but on the way out I had a quick nip around the shop for some treats. 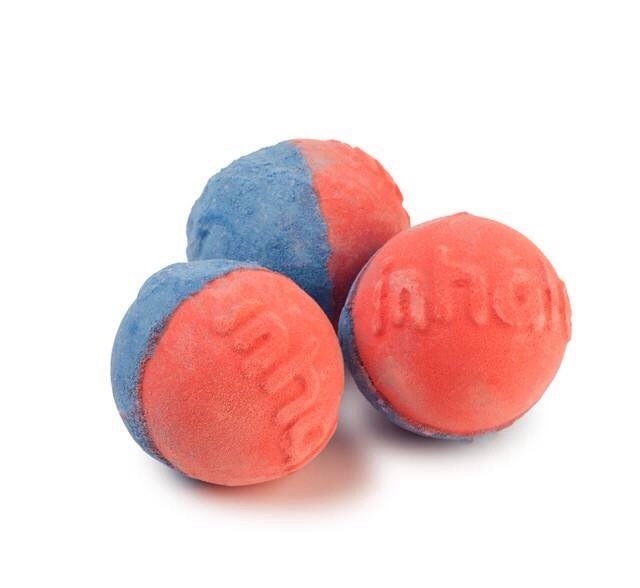 Firstly, the Inhale Exhale ballistic, this is a limited edition ballistic, and I want to go back and buy about 10! It’s scented with two different fragrances, Inhale & Exhale, coincidentally the same two scents in the incense used to scent the room for The Sound Bath. One side fizzes quicker than the other, so when it’s popped into the bath you get wafts of one scent, to start, and then part two changes the scent, and eventually the blend together to make The Breath of God scent. 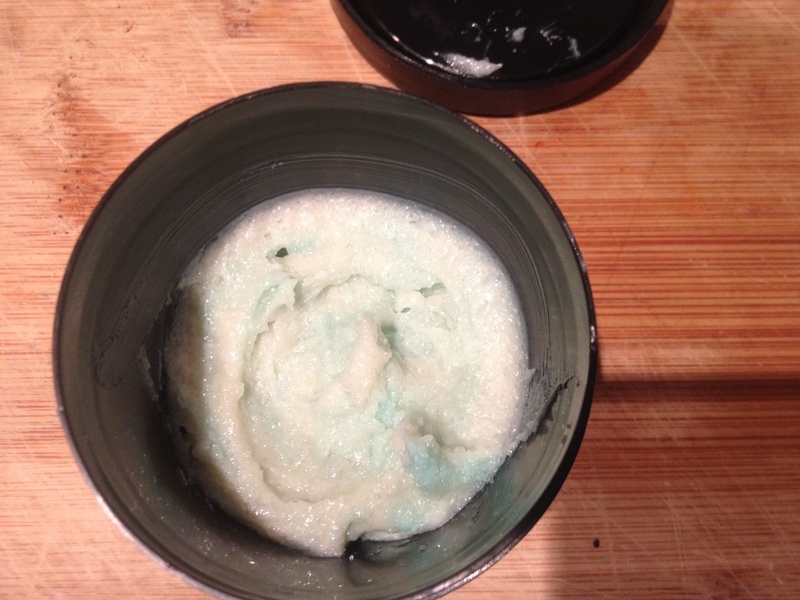 The other treat was a generous sample of Ocean Salt Face & Body Cleanser. I’ve tried Ocean Salt before, but the peeps in the Lush Labs have worked up a self preserving formula, doing away with the need to add in an artificial preservative. It smells much fruitier than the preserved version, and when I was chatting with Emma, the Liverpool Lush’s Trainee Manager, she explained one of the tweaks in the new formula is the addition of Mango Butter. This is also a good point to mention that the Ocean Salt sample is the only part of my trip I got for free, and also that this is the only photo I’ve taken myself! Thanks to Melissa on the Lush Liverpool’s facebook for letting me use the other 3 pictures. So anyone else tried The Sound Bath? Or any of the other treatments? Anyone interested in hearing about the self preserving versions of some of Lush’s classic products?